ABSTRACT. Bahia Salado, located in northern Chile (27°41' S, 70°59'W), is the southernmost foraging ground for the endangered green turtle (Chelonia mydas) in the Eastern Pacific Ocean (EPO). To date, almost no information exists on its current status, nor on its connectivity with nesting rookeries in the EPO. This study aims to inform on the genetic characterization, health and ecology of Bahia Salado's green turtle aggregation in order to provide baseline information for local conservation strategies. We describe population structure and residency times using mark-recapture method. We also examine health parameters (body condition index, blood profile and blood copper-Cu and lead-Pb concentrations) and regional connectivity through genetic analyses. Our results indicate that this aggregation is composed exclusively of juveniles, with residency times varying between five to sixteen months. Turtles exhibited a very good body condition; however they showed the highest blood concentrations of Cu and Pb described for C. mydas and for almost all sea turtle species. Some biochemistry parameters (albumin, calcium, phosphorus, AST, triglycerides and creatinine) are also the highest ever reported for this species in the region. Analysis of the 770 bp (base pairs) control region of the mitochondrial DNA revealed four haplotypes, suggesting a strong genetic connectivity to the Galapagos rookery. Our study indicates that Bahia Salado's aggregation represents a developmental foraging ground, where juvenile green turtles thrive. Although Bahia Salado's ecosystem seems to be a very suitable habitat for the species, the high levels of Cu and Pb, together with elevated AST, demand further research on the negative impacts of heavy metals on this aggregation. Our results highlight the importance to protect this bay from anthropological activities, evaluate pollution sources and other local threats to this particular coastal ecosystem. We recommend year-round monitoring of the green turtle aggregation and other components of this ecosystem, incorporating participation of local seaweed collectors and the fishing community. Keywords: green turtle, juvenile aggregation, foraging ground, body condition index, heavy metals, blood chemistry, mitochondrial DNA, natal origin, Chile. Green turtle (Chelonia mydas) is listed as globally endangered in the IUCN Red List (Seminoff 2004). In the Eastern Pacific Ocean (EPO), the green turtle is distributed along the west coast of North and South America (Quiñones et al., 2010) and is commonly known as "black turtle", due to morphological and color variations (Chassin-Noria et al., 2004). Throughout this paper, C. mydas will be referred to as Eastern Pacific green turtle. Factors driving green turtle distribution in the EPO are numerous and may vary from site to site (Jensen et al., 2012). In their initial life stage, hatchlings are dispersed by ocean currents and remain in the pelagic realm for several years until recruiting to coastal areas (Reich et al., 2007). These areas can be shared with adults or frequented only by juveniles (Amorocho et al., 2012), constituting a discrete benthic developmental habitat, as stated by Meylan et al. (2011). There is growing evidence for a by-size spatial segregation pattern between green turtle foraging grounds in the EPO (Seminoff et al., 2003; López-Mendilaharsu et al., 2005; Koch et al., 2007; Velez-Zuazo et al., 2014). Particularly in the southern EPO (Peru), Velez-Zuazo et al. (2014) observed latitudinal habitat segregation, where the northern location was composed mainly of sub-adults and adults, and the southern one almost exclusively of juveniles, corresponding to a benthic developmental foraging ground. Although the causes of this segregation remain poorly understood, it seems to be related with resource partitioning, and proximity to rookeries, among other factors (Bjorndal et al., 2000; López-Mendilaharsu et al., 2005; Koch et al., 2007; Meylan et al., 2011; Velez-Zuazo et al., 2014). Green turtle feeding areas are generally composed of individuals recruited from multiple nesting sites (Meylan et al., 2011; Amorocho et al., 2012). Genetic studies carried out in the EPO show that the major contributing rookeries to foraging areas in South America appear to be the Galapagos Islands (Ecuador), Michoacán (Mexico) and Costa Rica, and to a lesser extent, Revillagigedo (Mexico) and Hawaii (United States; Velez-Zuazo & Kelez, 2010; Alfaro-Shigueto et al., 2011; Amorocho et al., 2012; Veliz et al., 2014). Nevertheless, flipper tag returns, as well as genetic and telemetry studies conducted in Peru and Chile, suggest that the Galapagos Archipelago seems to be the principal rookery source for individuals of these South American green turtle foraging grounds (Velez-Zuazo & Kelez, 2010; Alfaro-Shigueto et al., 2011; Veliz et al., 2014; Donoso et al., 2016; Dutton et al., 2016). In Chile, six neritic aggregation areas have been described for green turtles, all of them located in the north of the country: Playa Chinchorro (18°28'S, 70°18'W), Bahía Chipana (21°19'S, 70°03'W), Bahía Mejillones del Sur (23°05'S, 70°28'W), Caleta Constitución (23°24'S, 70°35'W), Poza Histórica de Antofagasta (23°35'S, 70°23'W), and Bahía Salado (27°41'S, 70°59'W; Grupo Nacional de Trabajo de Tortugas Marinas, unpubl. data). All these habitats present soft-bottom areas with dominant macroalgae in relatively sheltered locations (Veliz et al., 2014; Sarmiento-Devia et al., 2015). Bahía Salado stands out as the southernmost aggregation and the bottom is dominated by macroalgae and an endemic seagrass, Zostera chilensis (Zavala et al., 2009). Historical evidence shows that green turtles are present in Chilean coastal waters year-round (Frazier & Salas, 1984; Bolados-Díaz et al., 2007; Brito et al., 2007). Although data on residency times of this species in local neritic habitats are almost unknown, there are recapture records between six months and three years from Playa Chipana and Bahía Mejillones del Sur, respectively (Bolados-Díaz et al., 2007; Veliz et al., 2014). Studies from other neritic areas remain lacking; nevertheless, Bahía Salado's green turtle aggregation seems to be permanent, at least since the 1980s (Brito et al., 2007). Worldwide, coastal environments have been affected by organic and inorganic pollution stemmed from a wide range of industrial, agricultural and urban sources (Komoroske et al., 2011). This is a particular issue in northern Chile, where trace-metals naturally occur and are also released into the environment by anthropic activities related mainly to mining (Ramirez et al., 2005; Castillo & Valdés, 2011). Sea turtles inhabiting neritic areas may be particularly sensitive to marine pollution due to their delayed maturation and longevity (Komoroske et al., 2011; Camacho et al., 2013). Recent evidence demonstrates that heavy metals decrease the immune response, leading to an increase in disease vulnerability, particularly in sea turtles (Day et al., 2007; Camacho et al., 2013; Carneiro da Silva et al., 2016). Alterations of red blood cell count and biochemistry parameters have also been reported in these species (Day et al., 2007; Camacho et al., 2013). Trace-metals analyses of green turtles' blood and carcasses from the Antofagasta Region in northern Chile, revealed above-average concentrations of arsenic (As), copper (Cu), lead (Pb) and mercury (Hg), reflecting industrial mining activity and subsequent heavy metal pollution in the region (Plaza-Araya et al., 2010; Canales-Cerro & Álvarez-Varas, 2015). Unfortunately no studies on pollutants or blood parameters in Bahía Salado's green turtles exist, although this region has been historically impacted by the mining industry (Ramirez et al., 2005; Castillo & Valdés, 2011). Additionally, to a lesser extent, local pollution sources related to vessel movement for macroalgae extraction exist in the bay (SUBPESCA, 2010). Marine pollution does not seem to be the only threat for Bahía Salado's green turtle aggregation. Preliminary data based on fishermen interviews from seven fishing coves adjacent to Bahía Salado, suggested a moderate bycatch rate, mainly associated to gillnets (49% of the 53 interviews; Cortés, unpubl. data). On the other hand, although algae extraction by local communities constitutes the major economic activity in this bay, its high degree of isolation and oceanographic characteristics have attracted big companies to develop non-renewable energy projects (i.e., thermoelectric plants based on coal and natural gas). Despite the above, the current status of this green turtle aggregation remains unknown, thus making it difficult to formulate appropriate local conservation plans in order to avoid or mitigate potential population impacts. Based on the latitudinal habitat segregation observed by Velez-Zuazo et al. (2014), we predict that the Bahía Salado's green turtle aggregation will represent a benthic developmental habitat dominated by juvenile individuals. Likewise, we expect a permanent turtle residence reflected in high recapture rates and wide recapture intervals, as reported for other Chilean aggregations of this species. Also, we believe that turtles will exhibit elevated levels of heavy metals in blood, concordant with the local historical pollution, and accordingly, alterations in blood and biochemistry parameters. Finally, taking into account the regional pattern of genetic contribution to foraging grounds in the EPO, it is probable that Bahía Salado's turtles carry haplotypes dominant or endemic to the Galapagos Archipelago, being the most proximate nesting rookery. Here, we provide new information in terms of ecology and health for the southernmost neritic aggregation of Chelonia mydas in the EPO. The overall objectives of the present study were to gather data on the population status of the green turtle in Bahía Salado, northern Chile, to provide baseline information for the development of fact-based local conservation strategies. Specifically, we describe: 1) population structure and residency times, 2) body condition index (BCI), blood parameters and heavy metals in blood as indicators of population health (Labrada-Martagón et al., 2010; Camacho et al., 2013; Suarez-Yana et al., 2015), and ultimately 3) connectivity of Bahía Salado's green turtle aggregation with nesting rookeries of the region using molecular markers. Bahía Salado (27°41'S, 70°59'W) is a bay located in the Atacama Region in northern Chile (Fig. 1). This region is characterized by a semiarid climate with a dense coastal cloud cover. Rain is rare and usually influenced by El Niño Southern Oscillation (ENSO), which manifests itself as a superficial dispersion to the south of equatorial waters with high salinity and high temperatures (Squeo et al., 2008). Bahía Salado is formed by shallow waters, reaching maximum depths up to 10 m. High algae coverage with seagrass (Zostera chilensis) patches near the high tide line can be found on the inner side of the bay where depths reach 3 m maximum (Zavala et al., 2009). Annual sea temperatures oscillate between 13° to 21°C in this area and the highest green turtle density is found at Playa La Hedionda (Álvarez-Varas, unpubl. data, Fig. 1). Figure 1. Location of the Bahía Salado study area in Chile. A total of four field trips of 10 days each, were carried out in spring 2013 (October), summer 2014 (March), spring 2014 (November) and summer 2015 (February) completing a period of sixteen months. Green turtles were captured in shallow areas (<2 m depth) using two entanglement nets (50×1.8 m, mesh size of 35 cm stretched). Nets were set during 8 h per day, and checked constantly from the coastline and by two apnea divers every 30 min. Upon capture, sea turtles were taken to shore to apply a standard monitoring protocol, including morphometry, weighing, tissue and blood sampling and identification. Turtles were tagged on each front flipper using Inconel tags (Style 681, National Band and Tag Company, Newport, Kentucky; Zárate et al., 2013) prior to release (holding time never exceeded 40 min per animal). All captures were authorized by the Chilean Sub-Secretariat of Fishing (SUBPESCA, by its Spanish abbreviation), through a Research Capture Permit granted in April 2013 (Exempt Resolution N°917) and renewed in July 2014. An estimation of catch per unit effort (CPUE) was calculated for each field trip by dividing the total number of sea turtles caught on each sampling occasion by the number of effort units. One unit effort was equivalent to one 8 h in-water set for two 50 m long nets (Koch et al., 2007). The following measurements were taken for each turtle (Eckert et al., 1999): minimum curved carapace length (CCL min), curved carapace length notch to tip (CCL), curved carapace width (CCW), straight carapace length (SCL), straight carapace width (SCW), plastron length (PL), plastron width (PW), head length (HL), head width (HW), tail total length (TTL) and post-cloacal tail length (PTL). Curved and straight measurements were obtained using a metric tape and a calibrated forester's caliper (±0.1 cm, straight measurements), respectively. Body mass was obtained using a spring balance (±100 g). Green turtles were classified in different life stages based on the mean CCL size of nesting females in Galapagos (Zárate et al., 2013). Turtles with CCL <85 cm were classified as juveniles and CCL ≥85 cm as adults. A body condition index (BCI = body mass x 10,000 / SCL3) was calculated to evaluate the relative "fatness" of captured turtles (Bjorndal et al., 2000). This index was used as an indirect predictor of the nutritional status and/or health condition of the animal (Bjorndal et al., 2000; Velez-Zuazo et al., 2014). Blood samples (5 mL) were collected from each turtle from the dorsal cervical sinus (Mader, 2006). 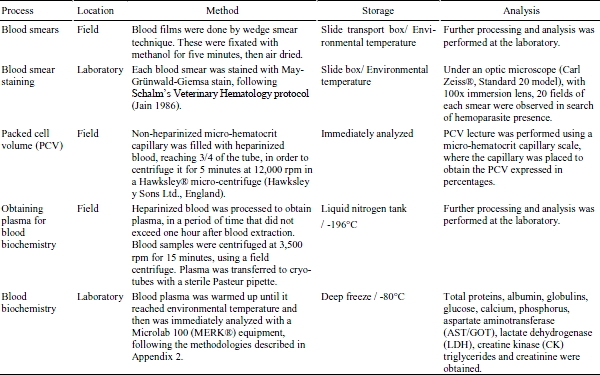 Three mL of blood samples (3 mL) were stored in heparinized tubes (BD Vacutainer®, NJ USA, 68 USP) and refrigerated until analysis. Type of processing, storage and detailed analyses of hematological and biochemical variables (including hemoparasites) are shown in Appendix 1 and 2. All laboratory blood analyses were carried out at the Laboratorio de Hematología y Bioquímica Clínica, Facultad de Ciencias Veterinarias, Universidad de Chile, Santiago, Chile. 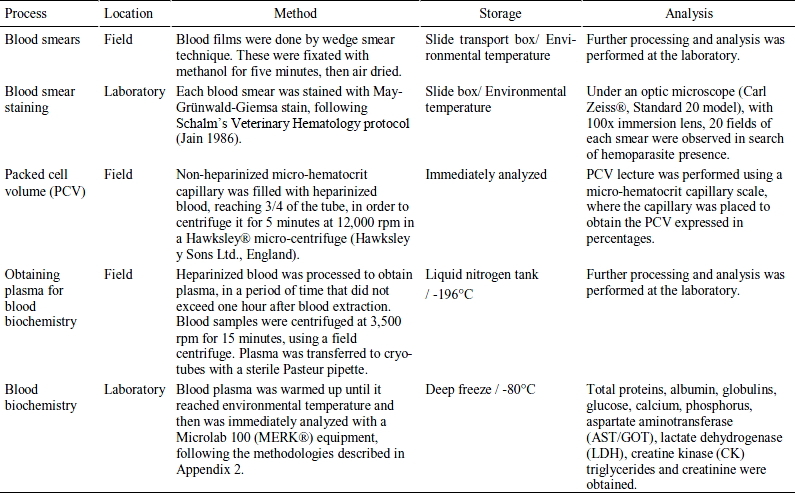 Two mL (2 mL) of the original 5 mL blood sample were also stored in heparinized tubes, placed in cryotubes and maintained in liquid nitrogen (-196°C). Copper (Cu) and lead (Pb) contents in blood analyses were carried out at the Laboratorio Veterinario Especializado (Vetlab®), Santiago, Chile. Samples were processed using Atomic Absorption Spectrophotometry (AAS) and metal concentrations were expressed in ixg g-1. Samples and standards were analyzed using a duplicate, in different series, and were read against target reagents in a spectral range λ 190-900 nm AAS Shimatzu® AA-6200 integrated to AWizard Software. For Cu determination, a calibration curve was designed using 10 dilutions with values between 0.10-10 μg g-1 which were obtained from a standard pattern of Cu certified concentration (SeronomTM Trace Elements Serum). Samples and standards were read at 1 324.7 nm, according to the standardized Cu protocol. For Pb, the calibration curve was designed with 10 concentration points in a range of 0.01-5.00 μg g-1, which were obtained from a standard pattern of Pb certified concentration (SeronomTM Trace Elements Whole Blood). Measurements were done at λ 283.3 nm. Skin samples (5 mm) were collected from the neck area of each turtle using a sterile scalpel. Samples were stored in ethanol at environment temperature. In order to determine the possible natal origin of Bahía Salado's green turtles, we amplified haplotypes of the mitochondrial DNA (mtDNA) control region. Therefore, DNA was isolated using the Aljanabi & Martínez (1997) protocol. The control region (D-loop; approx. 773bp) was amplified using primers LCM15382 (5'-GCTTAACCCTAAAGCATTGGO3') and H950g (5'-GTCTCGGATTTAGGGGTTTGO3') designed by Abreu-Grobois et al. (2006). Reactions were carried out in a total volume of 25 μL with 2 μL DNA, 1 × buffer reaction, 200 μM dNTP, 0.5 μM of each primer, 0.8 Platinum Taq DNA polymerase (Invitrogen) units and 1.4 mM of MgCl2. The Polymerase Chain Reaction (PCR) protocol was as follows: 10 min at 95°C, 95°C for 15 s, a touchdown at 60-50°C for 30 s, 72°C for 45 s, with 2 cycles at each annealing temperature, and 35 amplification cycles of 95°C for 15 s, 50°C for 30 s, 72°C for 45 s, followed by a final extension period of 30 min at 72°C. The PCR product was visualized using electrophoresis in 1% agarose with red gel. The previously described procedures were carried out at the Laboratorio de Biodiversidad Molecular, Departamento de Ecosis-temas y Medio Ambiente, Pontificia Universidad Católica de Chile, Santiago, Chile. Final products were purified and sequenced bilaterally at Macrogen Inc., Seoul, Korea. Raw sequences were edited and corrected manually using the GENEIOUS version 7.1.7 program (http://www.geneious.com, Kearse et al., 2012) and truncated to the standard length of 773 bp. Sequences were aligned using the ClustalX algorithm implemented in GENIOUS, and haplotypes were identified after running a BLAST search implemented in the GenBank database (National Center for Biotechnology Information, USA: NCBI Home page http://www.ncbi.nlm.nih.gov). The DnaSP program (Librado & Rozas, 2009) was used to calculate haplotype and nucleotide diversity for the neritic aggregation. A total of 320 net-set hours (equivalent to 40 unit effort) yielded 14 captured turtles consisting of seven different individuals, four of which were recaptured in a period of five and sixteen months (Tables 1, 2). Overall CPUE for first-time captures was 0.18 turtles per capture unit, thus equaling one turtle every 45 h of netting (Table 1). According to Zárate et al. (2013), all turtles were juveniles and ranged between 54.0-83.1 cm CCL (mean size of 66.5 ± 9.8 cm), and weighed from 19.5 to 76.0 kg (mean of 39.6 ± 20.0 kg; Table 2). The body condition index (BCI) ranged between 1.19 and 2.02 (mean of 1.66 ± 0.28). Morphological and BCI data for each turtle are shown in Table 2.
are shown in centimeters (cm) and weight in kilograms (kg). In all cases, blood smear examinations were negative for hemoparasites. Biochemistry analyses showed elevated levels of albumin, calcium, phosphorus, AST, triglycerides and creatinine. Results from hematology and blood biochemistry analyses for Bahia Salado's green turtles and other studies on this species from the EPO are shown in Table 3. Cu showed a mean blood concentration of 2.26 ± 0.10 μg g-1 and Pb of 1.11 ± 0.06 μg g-1, indicating high levels of these metals (Table 4). The sequences of the seven turtles exhibited three polymorphic sites, all of which were transitions. Four previously described haplotypes were identified in the sequences, where haplotype CmP-4.6 (GenBank accession number: KC306647.1) was found in three individuals, CmP-4.7 (GenBank accession number: KC306660.1) in two individuals and haplotypes CmP-15.1 (GenBank accession number: KC306649.1) and CmP-4.1 (GenBank accession number: KC306666.1) each in one individual respectively. Most of the analyzed haplotypes were dominant or endemic to the Galapagos Archipelago (Dutton et al., 2014). Haplotype diversity (h) was high with 0.81 ± 0.13 and nucleotide diversity (π) was low with 0.0017 ± 0.0016. Several studies show a small-scale, size-based foraging habitat segregation in green turtles from the northern EPO (Gulf of California, Mexico), where smaller juveniles inhabit relatively protected and shallow areas, and large juveniles and adults generally in deeper habitats (Seminoff et al., 2003; López-Mendilaharsu et al., 2005; Koch et al., 2007). Habitat segregation has also been observed in Peru, with sub-adults and adults occurring at the most northern locations and smaller juveniles dominating foraging areas at the southern coasts (Velez-Zuazo et al., 2014). Historical data indicate that C. mydas in Chilean waters correspond exclusively to juvenile and sub-adult individuals (Sarmiento-Devia et al., 2015), which is congruent with southern Peruvian foraging areas. Bahía Salado, located in northern Chile, harbors the southernmost neritic aggregation of green turtles in the EPO. Our results showed that this aggregation was composed only by juveniles according to Zárate et al. (2013), where sizes varied between 54.0 and 83.1 cm CCL (mean 66.5 ± 9.8 cm) and weights between 19.576.0 kg (mean 39.6 ± 20.0 kg). Thus, supporting the benthic developmental hypothesis stated by Meylan et al. (2011), and our prediction on exclusive presence of juveniles in this Chilean green turtle aggregation. Velez-Zuazo et al. (2014) reported individuals with sizes between 44.9 and 84.5 cm CCL (mean 57.7 ± 8.7 cm) at Paracas (~14°S), southern Peru. On the other hand, in the northern coast of Chile, Veliz et al. (2014) recorded green turtles between 47.0 and 75.7 cm CCL at Playa Chinchorro (~18°S), and Donoso et al. (2016), from 45.0-76.0 cm CCL at Bahía Mejillones del Sur (~23°S). With this information, a pattern of latitudinal segregation becomes evident. Southern Peru and northern Chile serve as green turtle developmental areas dominated by juveniles, whereas in northern Peru and likely in foraging areas closer to the equatorial realm, adults would be much more common (Velez-Zuazo et al., 2014; Veliz et al., 2014; Donoso et al., 2016). As ectotherms, green turtles are constrained by climatic, as well as, physical factors affecting the surrounding environment (Spotila et al., 1997). A previous study suggested that waters ≤25°C may represent the thermal threshold below which migrating adult females actively avoid surface waters in the EPO (Seminoff et al., 2008). However, thermal thresholds for juvenile turtles in the region remain poorly understood. In the northern Gulf of California (~28°N) green turtles are known to hibernate during colder months (Felger et al., 1976), while in Bahía Magdalena (~24°N) this does not seem to happen. Although sea temperatures decrease to 18°C during winter, in this place juvenile turtles only are less active and probably forage less (Koch et al., 2007). In Bahía Salado, sea temperatures drop below 13°C during the cold season; nevertheless, there are active turtles year-round (Brito et al., 2007). This, together with the presence of exclusively juveniles in this location, suggests that by-size latitudinal habitat segregation could also be related to ocean temperatures and thermal restraints. Feeding preferences have been linked with habitat segregation in the EPO as well (López-Mendilaharsu et al., 2005; Koch et al., 2007; Velez-Zuazo et al., 2014). Therefore, future studies taking into account these factors will allow further comprehension of the relevance of temperature in foraging ground segregation. On the other hand, the presence of so few green turtle individuals in Bahía Salado during our study, may be due to that this location corresponds to the southern distribution limit of the EPOs neritic aggregation of C. mydas. It is opposite to the high abundance found in the center of the distribution range for any species (Pianka, 1982). Coastal ecosystems off Peru and Chile are dominated by cold and nutrient-rich waters associated to the Humboldt Current System (Quiñones et al., 2010); however, in the region there is a high oceanographic and climatic heterogeneity due to seasonal and inter-decadal variations, such as El Niño Southern Oscillation events (ENSO; Quiñones et al., 2010). During ENSO, warmer waters (22°-28°C) reach the coast of South America probably facilitating sea turtle approach to Peruvian and Chilean coasts (Quiñones et al., 2010; Sarmiento-Devia et al., 2015). Likewise, local-superficial circulation and the Gunter Sub-surface Current that transport warm waters southward from tropical latitudes, could be modulating the proximity of sea turtles to the coast or the time that they spend in Chilean waters (Sarmiento-Devia et al., 2015). Our results showed a high recapture rate in Bahía Salado (~27°S), with four of the seven turtles recaptured in a period of five and sixteen months (Table 1, 2). In Peru, Velez-Zuazo et al. (2014) reported a mean recapture rate of 26% and 12.5% and a maximum recapture interval of 1015 days and 680 days (during three years of study) for El Ñuro (~4°S) and Paracas (~14°S), respectively. In northern Chile, a recapture rate of 3.9% with a maximum time of residence of three years was reported by Bolados-Diaz et al. (2007) in Bahía Mejillones del Sur (~23°S) between 2003 and 2007. Moreover, Veliz et al. (2014) mentioned only one recapture with an interval of six months from a total of 18 turtles captured in Playa Chipana (~18°S) throughout almost two years of studies. As initially predicted our results showed a high recapture rate and wide recapture intervals, as reported for other Peruvian and Chilean neritic aggregations. It is plausible, considering that Bahía Salado's aggregation is small, and it suggests a high residence of juveniles in this bay. On the other hand, preliminary data based on stable isotope analysis, indicated that Bahía Salado's green turtles are feeding on the endemic seagrass Zostera chilensis (Álvarez-Varas, unpubl. data). Therefore, all these results highlight the relevance of this location as a developmental foraging ground for C. mydas in the southern EPO. Blood has been recognized as an indicator of recent exposition to pollutants in sea turtles, unlike tissues such as skin, carapace or some internal organs, which constitute a proxy of chronical exposition (Day et al., 2007; Ikonomopoulou et al., 2011; Komoroske et al., 2011). Vast evidence indicates that the route of entry of pollutants in these species mainly occurs through food intake (Torrent et al., 2004). Thus, blood samples could provide an approach on contamination of the site where turtles feed. Concentrations of Cu and Pb found in the blood of Bahía Salado's green turtles (2.26 ± 0.10 μg g-1 and 1.11 ± 0.06 μg g-1, respectively) corresponded to one of the highest values described for C. mydas and for almost all sea turtle species (Table 4). Green turtles at Poza Histórica de Antofagasta (~23°S) presented similar values (2.80 ± 0.40 μg g-1 and 0.70 ± 0.40 μg g-1, respectively; Canales-Cerro & Álvarez-Varas, 2015; Table 4). Likewise, Plaza-Araya et al. (2010) reported elevated levels of As, Cu, Pb and Hg in liver and kidney of Chelonia mydas and Lepidochelys olivacea, also from Antofagasta. Elevated concentrations of heavy metals in turtles from Chilean neritic foraging grounds could be related to the intense and historic mining activity in the north of the country (Ramirez et al., 2005; Castillo & Valdés, 2011). In the same way, industries, ports, productive and touristic activities, may also contribute to this situation (Castillo & Valdés, 2011; Valdés & Castillo, 2014). Bahía Salado lacks large sources of local pollution; however, it is where the major forest of Macrocystis spp. of the Atacama Region is located, which mainly supplies the abalone industry of the region (SUBPESCA, 2010). Algae extraction is associated to a high amount of small vessels (~15 vessels day-1 during 9 h each day, Álvarez-Varas, pers. obs.) that transit daily throughout the bay. Previous studies carried out a few kilometers northward of this bay, showed elevated concentrations of Cu and Pb (among other trace-metals) in marine sediments and benthic organisms (Castillo & Valdés, 2011; Valdés & Castillo, 2014). Such results were attributed to an active atmospheric transport of heavy metals, local aquaculture activities and mineral characteristics of the area (Castillo & Valdés, 2011; Valdés & Castillo, 2014). In the particular case of Pb, Valdés & Castillo, (2014) suggested that the elevated levels found in marine sediments could be due to residues of fuel and paint used in aquaculture activities. Therefore, all these factors, together with the effect of coastal currents (Ramirez et al., 2005) may contribute to the high levels of these pollutants in our study's turtles. However, further research should incorporate other biological and environmental matrixes (e.g., heavy metals in sediments, water column, main preys of turtles, etc.) to better evaluate the extension of heavy metal inputs in the local environment. Moreover, in order to be able to attribute with certainty that the levels of Cu and Pb observed here are due to local pollution, it is necessary to understand movement patterns and residency times of turtles in the bay. Bahía Salado's green turtles exhibited the highest values of BCI reported for foraging populations in the EPO (1.66 ± 0.28). Seminoff et al. (2003) reported BCI of 1.42 ± 0.02 for green turtles in Baja California Peninsula (~28°N), Mexico; Koch et al. (2007) values of 1.35 ± 0.13 in Bahía Magdalena (~24°N), Mexico; and Velez-Zuazo et al. (2014) of 1.50 for turtles at El Ñuro (~4°S) and Paracas (~14°S), Peru. Our results suggest that this location constitutes a very favorable habitat for this species probably due to that in temperate feeding grounds, the combination of younger stages, low temperatures and high prey availability may speed green turtle's metabolism, thus they grow and gain weight relatively fast (Velez-Zuazo et al., 2014). Our results in hematology and blood biochemistry showed that Bahía Salado's green turtles exhibited several variables exceeding those reported for C. mydas from other locations of the EPO (Labrada-Martagón et al., 2010; Suarez-Yana et al., 2015; Table 3). Values of albumin, calcium, phosphorus, AST, triglycerides and creatinine reported in our study, were several magnitudes higher than those documented for juveniles by Labrada-Martagón et al. (2010) from Punta Abreojos (~26°N), and Bahía Magdalena (~24°N), Mexico (Table 3). Likewise, AST, total protein and creatinine from Bahía Salado's turtles were higher in comparison with values published by Suarez-Yana et al. (2015) from Sechura Bay (~5°S), Peru (Table 3). In Baja California Sur, Labrada-Martagón et al. (2010) observed that during summer, juvenile green turtles had significantly higher concentrations of triglycerides, glucose, uric acid and total protein compared with those captured in winter; and during cold season's triglycerides and albumin decreased markedly. In addition, they suggested that elevated values of triglycerides, total protein, albumin and globulins, together with a good body condition of the turtles, may reflect a food rich environment (Labrada-Martagón et al., 2010). According to this, the elevated concentrations of triglycerides, albumins, and total protein reported here, could be due to high food availability (Labrada-Martagón et al., 2010), or to reflect the high productivity season when turtles were sampled. Our field trips were carried out during spring and summer months when sea temperatures ranged between 15-21°C. As it is probable that these parameters decrease, or at least change during the cold months, it is fundamental to extend blood monitoring throughout the year at Bahía Salado. Sea temperatures reported by Labrada-Martagón et al. (2010) during winter in Baja California Sur were around 19°C. This suggests that although water temperatures are low in spring and summer in Bahía Salado, green turtles were thriving and probably this environment has high food availability. On the other hand, concentrations of triglycerides, calcium and total protein may also increase significantly in postprandial turtles (Anderson et al., 2011; Phillips et al., 2015) and individuals with diets high in seagrass can exhibit elevated values for the latter (Whiting et al., 2007). Thus, elevated concentrations of all these parameters in Bahía Salado" s green turtle aggregation could be attributed to the moment turtles were captured since they are presumably feeding in the area, and/or diets based on seagrass. The good condition of Bahía Salado's green turtles is also supported by high levels of calcium and phosphorus. Labrada-Martagón et al. (2010) found that injured turtles from Punta Abreojos (~26°N) had lower calcium, potassium and phosphorus levels compared to healthy turtles. Nevertheless, the high concentration of AST reported in the present study is striking. High values of this enzyme have been related to muscle damage and capture stress (Aguirre et al., 1995). Likewise, Labrada-Martagón et al. (2010) indicated AST is related to hepatocellular damage, and that its increase may be a physiological response to some contaminants in C. mydas. As our heavy metal analysis showed very high Cu and Pb concentrations in blood, AST values found in Bahía Salado's green turtles may be due to pollutant exposure or associated to turtle capture and handling (Aguirre et al., 1995; Suarez-Yana et al., 2015). In reptiles, unlike mammals, blood creatinine concentration is generally considered to be a poor indicator of renal function (McArthur et al., 2004; Mader, 2006). In this study, causes that could be associated to an increase of this metabolite remain unknown. However, there have been sick chelonian cases reported where creatinine values were below (and not above) the reference range for the species (McArthur et al., 2004). This could suggest that the values reported here not necessarily are associated to an abnormal or pathological condition. Foraging grounds of C. mydas commonly consist of genetically mixed stocks made up of turtles originating from different distant rookeries (Bolker et al., 2007; Bowen et al., 2007; Amorocho et al., 2012). Due to small sample size, we could not perform a mixed stock analysis (MSA) to determine statistically significant contributions from regional nesting rookeries. However, our overall picture of haplotypic characterization reflects what has been observed in other eastern and southeastern Pacific C. mydas foraging grounds and which are dominated by individuals deriving from the geographically closest nesting rookery in the Galapagos Archipelago. The very first MSA conducted in the EPO showed that juveniles foraging at Isla Gorgona (~2°N), Colombia, were composed by more than 80% of the Galapagos stock (Amorocho et al., 2012). Similarly, a recent characterization of the C. mydas aggregation at Playa Chinchorro (~18°S, northern Chile) recovered ca. 540 base pair long Cm-P4 (H1) as the most frequent haplotype, followed by Cm-P5 (H2), haplotype Cm-P17 and Cm-P93 (H3 and H4 respectively; Veliz et al., 2014). Considering the frequency of these shorter sequences in regional nesting stocks (Chassin-Noria et al., 2004; Dutton et al., 2008), the Galapagos rookery seems to be the principal source rookery for this South American feeding ground. Although larger fragments of -770 bp provide better resolution for natal origin estimations (Jensen et al., 2012), the observed pattern does not seem to differ. Using longer mtDNA sequences, MSA on a northern Chilean foraging ground at Bahía Mejillones del Sur (~23°S) and from incidentally caught green turtles in the Peruvian and Chilean longline fishery, both estimated a Galapagos contribution of more than 95% (Donoso et al., 2016, Dutton et al., 2016). Given that most of the individuals sampled at Bahía Salado also carried haplotypes dominant or endemic to the Galapagos Archipelago as was predicted (Dutton et al., 2014), this seems to be the major source population for South American green turtle foraging grounds. This supports previous observations on a regional structure in the distribution of northern and southeastern green turtle populations, where the Galapagos rookery contributes to foraging grounds from the South American to Central American coastline, and the Mexican rookery at Colola to the northeastern Pacific region (Seminoff et al., 2015). Therein, a recent MSA on the adult foraging ground at Poza del Nance in Guatemala (Chavarria, unpubl. data) marks the Central American boundary for individuals originating in the Galapagos Archipelago, with an estimated contribution of less than 20%, while at Isla del Coco, in the Pacific of Costa Rica, this rookery still contributes by more than 90% (Heidemeyer, unpubl. data). Thus, Bahía Salado represents the southernmost foraging ground known to date for green turtles nesting in the Galapagos Archipelago. Our study suggests that Bahía Salado constitutes a developmental habitat for C. mydas in northern Chile, supporting the hypothesis of a latitudinal pattern of by-size habitat segregation in the south of the EPO. Furthermore, this bay represents the southernmost aggregation area for the Galapagos rookery in the EPO described to date, therefore demanding further knowledge and protection, especially on migratory routes between both habitats. The high site fidelity reported here implies that Bahía Salado's green turtles could be staying for many years in this location before migrating to reproductive areas. Also, the good body condition shown in turtles from this bay indicates that the local ecosystem may be of great importance for their preparation for reproduction, highlighting the importance to conserve all of its associated biotic and abiotic components. The elevated heavy metal levels and alteration of some blood parameters in Bahía Salado's green turtles demand further research on the contamination extension and main pollution sources in the bay. Moreover, studies about sub-lethal effects (i.e., immunosuppression, higher susceptibility to diseases, lower growth rates, among others) eventually induced or caused by heavy metals in this aggregation are necessary. The above could directly impact the major rookery of green turtles in the EPO (Galapagos), thus affecting the population at a regional level. Likewise, it is fundamental to evaluate and quantify other threats that may generate negative impacts on the turtles and this ecosystem such as bycatch, seagrass meadow degradation, boat collisions, among others. Although our study showed that Bahía Salado's aggregation is small, it is probable that there is a continual arrival of individuals from adjacent foraging areas, as was observed during recent field trips, where new turtles were captured. Thus, the absence of local conservation strategies may impact the green turtle population in the region at a higher scale. Ultimately, our results point to increase monitoring and research of this ecosystem's quality in terms of pollution and food availability, as well as trophic ecology and movement patterns of turtles in this area. In the same way, it is necessary to involve local seaweed gatherers and the fishing community in local conservation strategies in order to achieve long-term protection of this extreme green turtle feeding ground and this valuable ecosystem. We thank Qarapara Tortugas Marinas Chile NGO's team for their support in the field. Thanks to the Totoral community for their willingness, especially Karina Jorquera and John Michada for their help in activities conducted in Bahía Salado. We are also especially thankful to Betsy Pincheira, Carlos Olivares, Daly Noll, Ana María Ramírez, Universidad Mayor students of the Conservation, Biodiversity and Environment Internship, as well as the National Oceanic and Atmospheric Administration (NOAA), Rufford Small Grant, Idea Wild and the Chilean Government Environmental Protection Fund (FPA). Their valuable collaboration made this study possible. Finally, we thank Patricia Zárate, Aldo Pacheco and Ximena Velez-Zuazo for their comments and suggestions that helped us improve the manuscript. aminotransferase, LDH: lactate dehydrogenase, CK: creatine kinase.